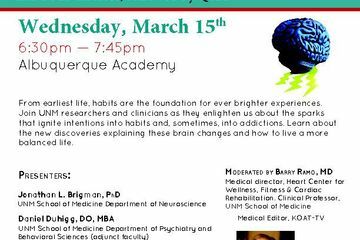 UNM experts are hosting a night of intrigue with a free public talk on the latest discoveries in neuroscience, the paths to habits and addiction and how to live a more balanced life. 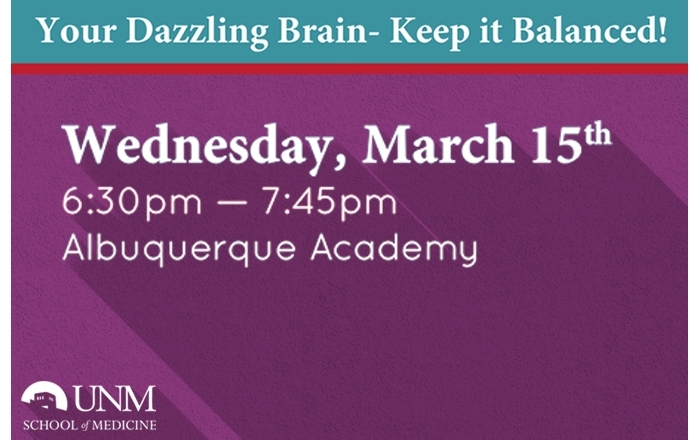 “Your Dazzling Brain – Keep it Balanced” runs 6:30-7:45 p.m. at the Albuquerque Academy Simms Center for the Performing Arts, 6400 Wyoming Blvd NE. From earliest life, habits are the foundation for ever brighter experiences. Join UNM researchers and clinicians as they enlighten us about the sparks that ignite intentions into habits and, sometimes, into addictions. Learn about the new discoveries explaining these brain changes and how to live a more balanced life. Jonathan L. Brigman, PhD, UNM School of Medicine Department of Neuroscience. Brigman received his PhD in cognitive neuroscience from George Washington University and completed a postdoctoral fellowship at the National Institute on Alcohol Abuse and Alcoholism. His research focuses on the mechanisms and neural circuits underlying well learned action and executive control of behavioral flexibility. Daniel Duhigg, DO, UNM School of Medicine Department of Psychiatry and Behavioral Sciences (adjunct faculty); Presbyterian Health Services Addiction Services. Duhigg completed a fellowship in addiction psychiatry at the University of New Mexico and a residency in psychiatry at The Ohio State University. He earned his DO at Kansas City University of Medicine and Biosciences and a MBA in health care leadership from Rockhurst University. V. Ann Waldorf, PhD, UNM School of Medicine departments of Psychiatry and Behavioral Sciences, and Family and Community Medicine. Waldorf serves as vice chair of behavioral sciences in the Department of Psychiatry and Behavioral Sciences. 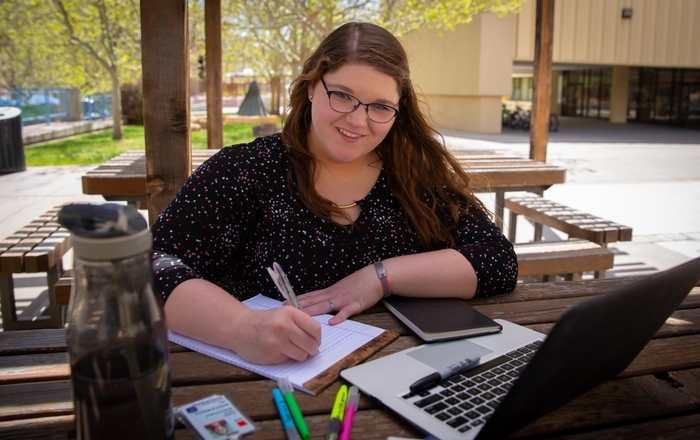 She earned her PhD in psychology with a clinical emphasis and a minor in psychobiology from UNM. Please register for this free public event at http://www.aa.edu/Page/Community/Community-Academy. 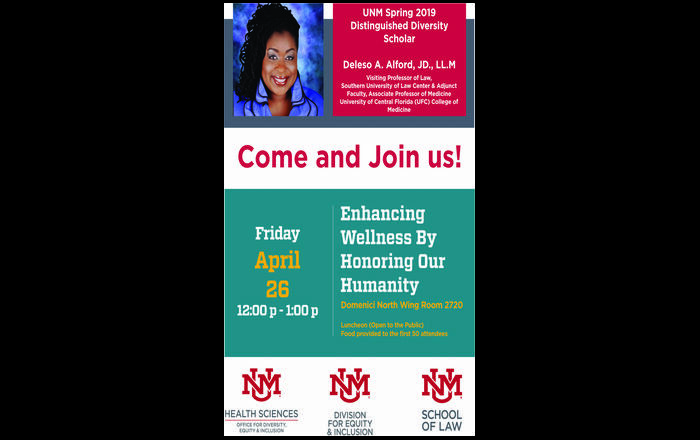 For more information, contact Lori Peterkin at (505)272-8085 or lpeterkin@salud.unm.edu.